Fuel Injector Pro by 104+ is a complete fuel system cleaner, designed and formulated with engine cleaning agents that will clean engine carbon deposits, fuel injectors, intake valves and combustion chambers to increase acceleration, and restore that lost power. 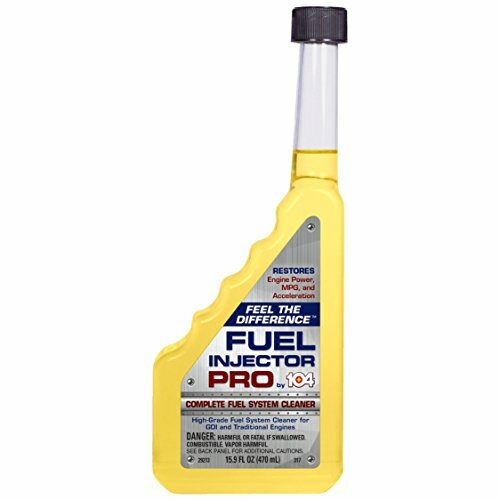 This best in class Fuel Injector Pro is formulated to work on today's modern high combustible (GDI, DFI) engines but also will work on traditional engines / motors. What's GDI & and Why use Fuel Injector Pro? Gasoline Direct Injection is a growing trend in automobiles and a continuing rise of GDI engines in cars will soon overpower traditional engines. What does this mean to you? First, lets get scientific and explain in simple terms what a GDI engine is and does. Every engine has intake valves, also known as cylinders. These cylinders are what cause your car to run. Each cylinder has a combustion chamber which is where pressurized gasoline, via a fuel line, is injected. In gasoline direct injection engines, the fuel injector is positioned directly into the combustion chamber. So what does this all mean? Ultimately it means better engine performance. But this better performance comes at a big price. That big price is in the form of carbon deposits. And not just any carbon deposits. We're talking heavy, caked-on deposits that come about quicker. Not the greatest trade off, right? Remember our secret, though? Fuel Injector Pro prevents these carbon deposits and is stronger than any normal detergent or cleaning agent for your engine. Bye bye stubborn carbon deposits! If you have any questions about this product by 104 + OCTANE BOOST, contact us by completing and submitting the form below. If you are looking for a specif part number, please include it with your message.